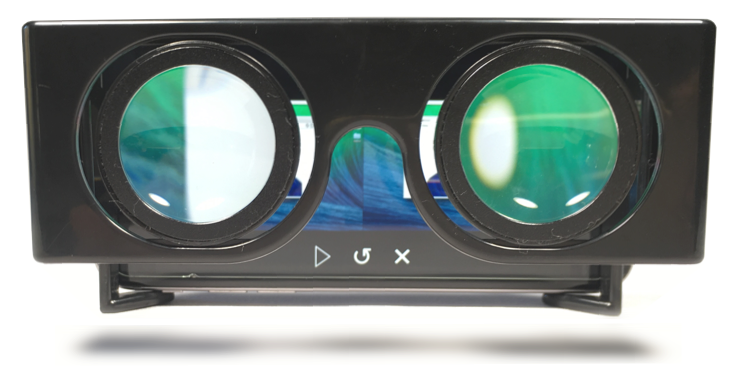 Comes with a pair of black frames, the Elsewhere 3D app, and a QR code to unlock the app. Elsewhere makes videos and screens 3D. It uses a new kind of video-processing that converts motion into depth. It works on any moving image, from iPhone footage to animated GIFs. Put them on your phone, open the app, and look through. When you look at the real world through Elsewhere, everything is somehow more 3D. Everything in the conference room around me seemed to gain another dimension. Walk around your house for an uncanny free trip that feels, at times, somehow more 3D than actual reality. I sat in the lobby of a fancy San Francisco hotel looking around slack-jawed... you feel like... you’re Eleven in Stranger Things, standing in the dark nothingness of the Upside Down, looking at something miles away. Elsewhere also makes screens 3D. Try watching: YouTube, Netflix, Skype, trippy GIFs, mirrors. Elsewhere makes every video in your camera roll immersive 3D. I’m watching a video of my toddler [in Elsewhere], shot just a few weeks ago, eating breakfast in his highchair. It’s just another iPhone video shot on just another day. But re-watching it now, his rounded cheeks bubble up from the screen. His hair glistens with a quality of light that’s just not there in reproductions. And a bit of yogurt sticks to his lips, so real, so visceral, that I remember 3D video at its best is second only to real life. Try watching: Your own memories, baby videos, GoPro footage, video from the Internet.